You won’t need to spend a fortune on expensive flights with this recent slot games from Lost World Games. You can hop to Rome to London to New York and Tokyo in the blink of an eye all whilst causing chaos as you go. With 5 reels and 3 lines, there are some great bonus features as well as two Wild symbols. There’s also Free Spin available, make sure you keep an eye on them! So are you ready to cause as much trouble as you can with Rampage Riches? One of the best mobile slots around at Slotsbaby! If you love promo's, check our slot bonus spins today. Rampage bonus: get scatters on reels 1, 3 and 5 to trigger this. The pick from 1 f 4 cites to rampage through. The further you get with the battle, the bigger rewards you’ll get. Exploding Wild bonus: this is only available on reel 3. Get the exploding Wild on this reel and you could get 2 to 5 regular wild symbols. Free Spin bonus: this is only available on reels 2 and 4. 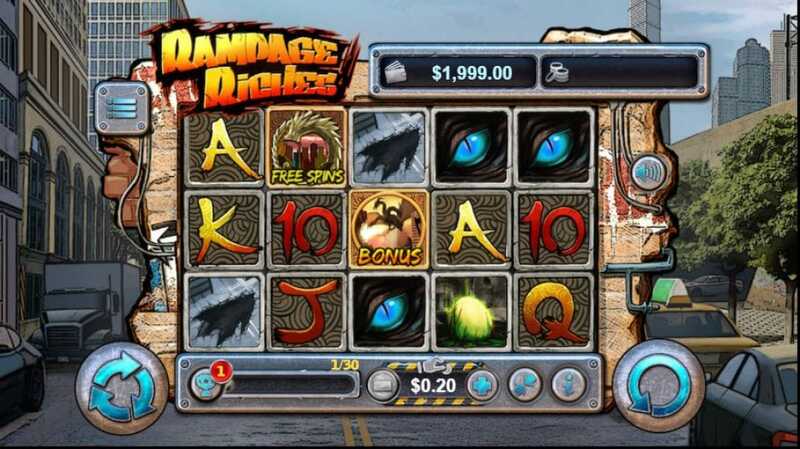 You’ll get 5 free spins and wild symbols can be added onto reels 1, 3 and 5.